Ukraine nuclear plants facing meltdown? Building a concrete sarcophagus over the Chernobyl plant. Total deaths from radiation exposure estimated at 985,000 as of 2007. Image from RT dot com. Link to article here. …(as Dr. Helen Caldicott points out recently), any escalation of our funny little proxy almost-war in Ukraine is by definition a nuclear war–Ukraine has 15 active nuclear power reactors, and any disruption of the power grid would lead to meltdowns. 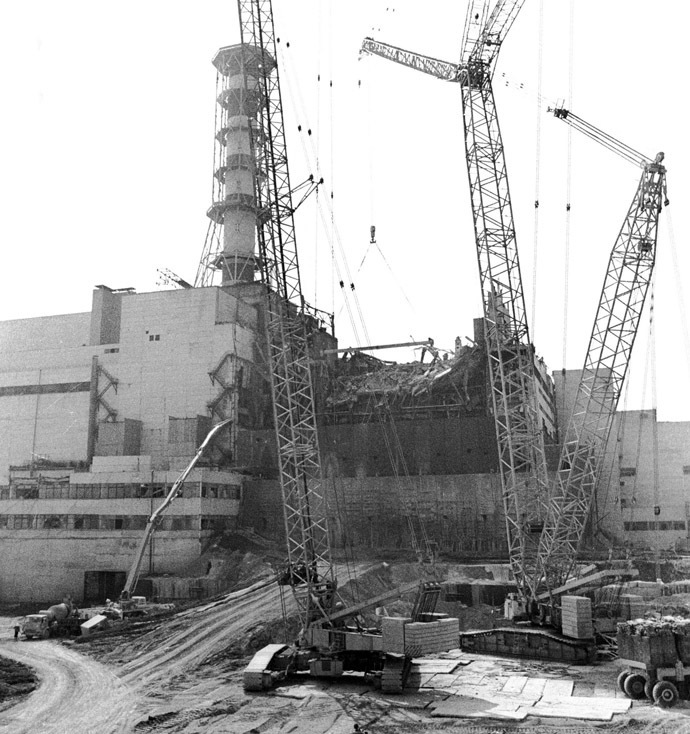 Those disruptions aside, someone targeting a reactor with a few stray rounds of artillery would almost certainly set events in motion that would make Chernobyl look like ants at a picnic. I hate it when I have a chance of being right about stuff like this. Russia’s Crimea was forced to switch to autonomous reserve power after transmission towers in the adjacent Ukrainian region were blown up, causing a blackout. Meanwhile, the repairs were delayed by Right Sector and Crimean Tatar“activists” attempting to block crews from getting to the scene. None of the groups have accepted responsibility. Robin’s blog SeemoreRocks then links to a report out of RT on the seriousness of the situation. People might remember that one of the apocalyptic predictions from the scientists who inform the Near Term Human Extinction movement is that a crash of the economic system would lead to an interruption of power that keeps the 400+ nuclear power plants in the world from having their fuel melt down. The potential for this is covered on Guy McPherson‘s blog. The big issue is that the vast majority of Nuclear Power plants are storing hundreds of tons of ‘spent’ fuel that must be constantly cooled so that the uranium inside doesn’t melt down into unquenchable fires. Michael C. Ruppert had said that Fukushima alone was a human extinction event, and he have been right. But if somebody doesn’t let the technicians in Ukraine repair the electrical grid and put those plants back online, it’s a moot point. We’ll have plenty of meltdowns to deal with in short order.